I wanted to include a way to navigate threw your library within Kodi. the main reason for this is to allow you to launch games from a remote control like yatse or a web browser. 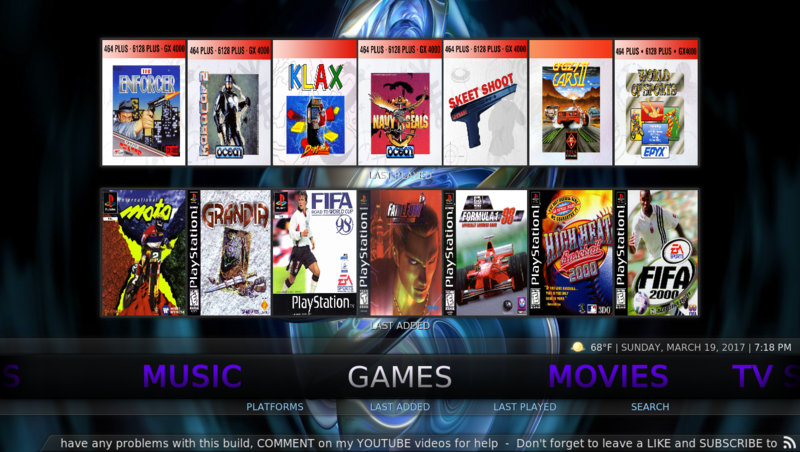 I also wanted to be able to add a widget in kodi listing some of the games. the way the addon pulls information is pretty bugy as it is reading LaunchBox's separate xm files and pushed into a sql database. some emulators may return errors as I am unable to create every scenario. at this stage I can only confirm that RocketLauncher and Retroarch is working. I will need to do some more testing to confirm the rest. addon is listed under video addons(i will get around to fixing this sometime). unabale to launch games that require extraction. 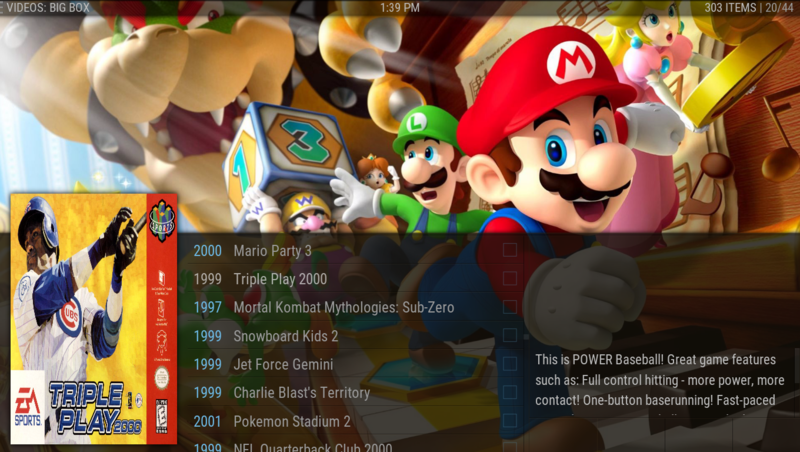 only games that use retroarch are supported in the Linux and Android Version. network shares most likely do not work unless the drive is mounted under the operating system(eg. mounted as /mnt/gamesdrive in linux or android or mapped network drive in windows). updated the addon it now writes the database to a sqllite database. this allows for the use of the search function and getting things like Latest Updates. Updated again. Fixed some bugs. 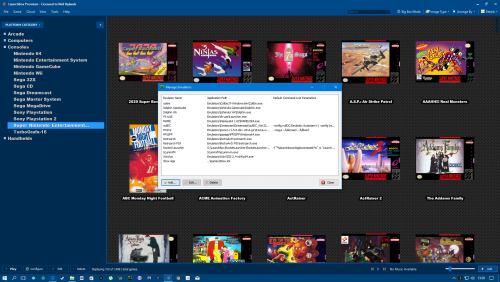 I added some new tables in the sql database to allow for better emulator detection. Fixed games with ' in the file path. Added working directory to launch command. I can't get the addon to run installed Windows games (.exe files), is this a feature to be implemented soon or am I missing something? Emulator games run fine. edit: it scrapes Windows games, says Big Box encountered an error when trying to launch a game, dunno where the log file is located tho. i am aware of the problem. i will be posting an update next week that will hopefully fix this. the issue is due to how i read the data. because windows doesnt have an emulator there is a space in the cmd line paramater where the emulator should be. Great to hear it, keep me posted on when the update is available, cant wait. Any other features added to the update? I am in Joburg at the moment so I haven't had time to focus on this. but it all depends on how much time I have to work on this and what features I will be using myself. I'm glad its working for you, everything image wise imports just fine. Which is a very good start all my games and images are there. Nothing launches though. So I will check back in on this at a later date. what emulator are you using to launch games? are you using rocket launcher? can you try running kodi as administrator and see if that makes a difference. can you provide me with the error you are getting? I am still busy with the image process, sometimes Launchbox uses a sub directory like North America I am still busy collecting all possibility's. Hi, I am not using rocket launcher, most of my platforms use retroarch except gamecube/wii, PS2 and Arcade which use Dolphin, PCSX2 and MAMEUI 64bit. When I try to launch bigbox from your addon it launches just fine, but whenever I try to launch a specific game I just get a KODI ERROR CHECK ERROR LOG dialogue. I tried running KODI as administrator and get exactly the same problem and error. 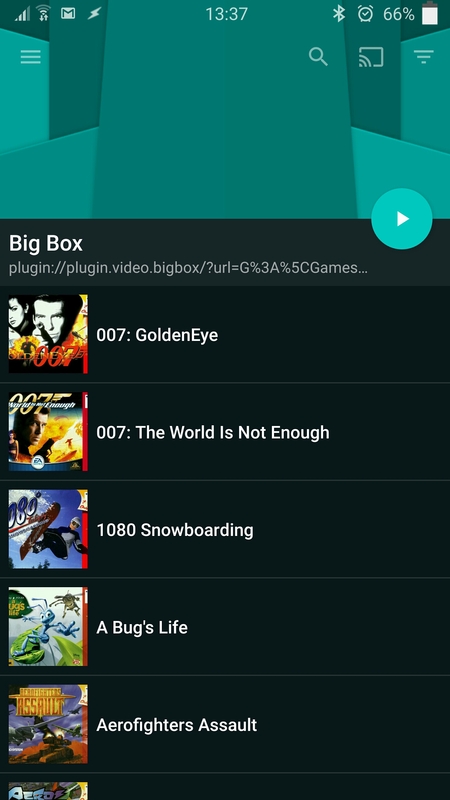 I have looked at the KODI log and don't see anything about your plugin in there, although to be honest I don't really no what I am looking at, I will attatch my KODI log for you to check over. Thanks for your help on this. I had a look at your log and found that Kodi doesn't log the error properly, however I did find the reason why it doesnt log is because the script doesnt crash but its not able to pass the launch command. does your emulator path contain spaces? I havent written logic to prevent spaces in emulator path so this can be causing an issue. I have however posted a new update. no new features but I have written some logic to fix some launch commands. windows games should work in theory now but I havent properly tested it yet. I have added new logic for steam games as I found they where not working in my test. 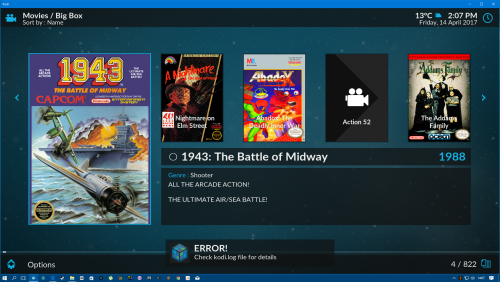 Launching Windows games now work flawlessly, big thank you for your hard work and recent update. However, some Windows games don't seem to have a cover downloaded (as opposed to in "normal" Launch box/Big box mode). Edit: Is it possible to (in the future) add screenshots instead of blank fanart? Using eminence 2.0 and the cover shows up but there's just a black window where fanart is for Movies normally. Love the plugin! 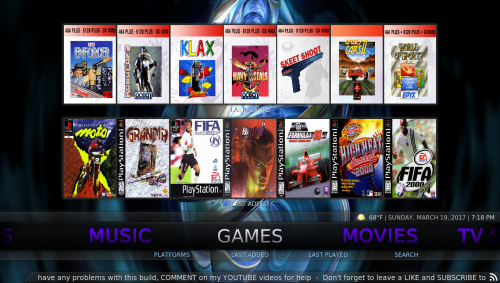 Yea no worries, im away in Fiordland this long easter weekend but once i get home ill update the plugin and test some stuff out and send you any bugs i come along.... this pluging is great bcoz it becomes a bit of an effort adding pc games n such via the Advance Launcher in kodi... but now with this plugin i can favorite my games and have them placed were ever i want... im using the xperience1080 theme BTW. Thanks for you work on this plugin. New Update is available. I did a bit of research into the images. I found games containing "'" where not finding images as well as games containing "!" I have fixed these as well as I have added more fallback images to both Thumb and Fanart. you will need to run the Update database to get the missing images. 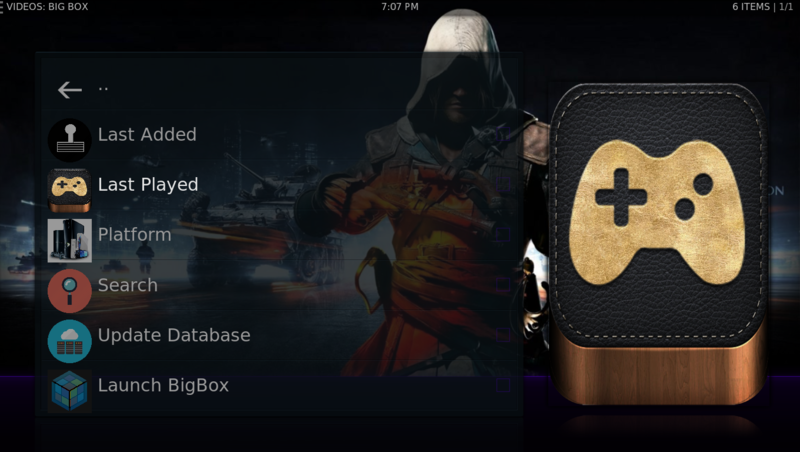 I have added a Favorite category that will display games marked as favorite in Launchbox. fixed some blank game images. replaced the ugly NULL in game description with "No Game Information Found"
replaced the ugly NULL in platform description with "No Platform Information Found"
changed the Publisher to SlipSystem because mettlekettle is not my name. add Icons for Genre and Favorites if anyone wants to help with some icons because I just took images of google. I don't think I have any spaces in my emulator paths, here is a shot of my launchbox emulators screen if it is any help to you. I have updated the addon to allow spaces in Emulation Paths. OK great, ill try out the new version. Thanks. Unfortunately I still have the same issue, however I do get a extra dialogue now showing emulator and rom path, I then click OK and get the error again. Attaching screenshots if it helps you. 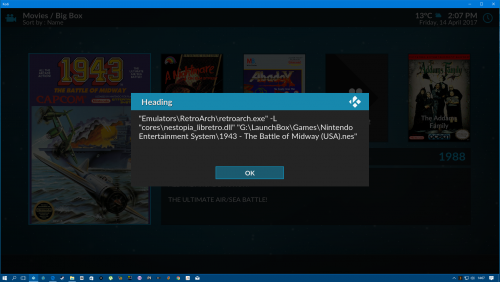 are the emulators inside the emulators folder in launchbox? that dialog box was a mistake it was for testing purposes and was ment to be taken out. i will do some more testing with the path join when i get back to cape town.